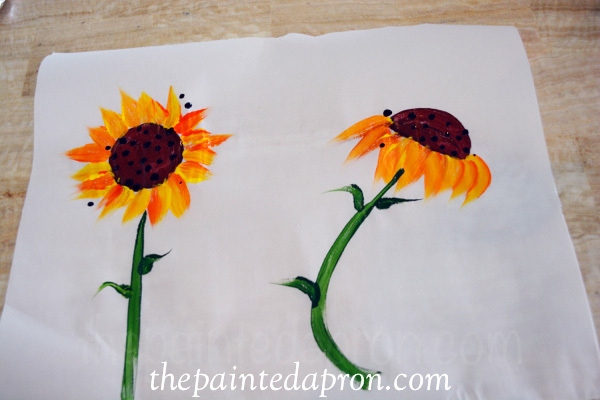 Sunflowers are everywhere right now and they are easy peasy to paint! When you want to paint something take a few minutes to really look at your subject. Look at the proportions of the different parts and study the color. Dip a clean smaller round brush, #6 into a dark green, then into yellow. Make a long stroke from the bloom downwards. Do this quickly for the straightest result- BUT it doesn’t have to be straight, a gentle curve looks good too. 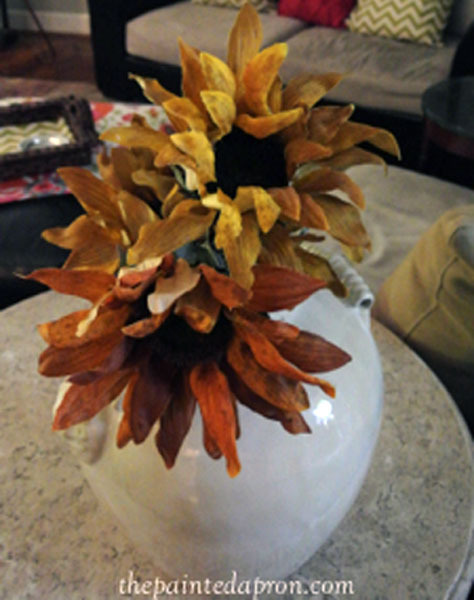 I have been enamored by sunflowers recently also. I don’t even own any paint brushes which probably tells you my painting ability level but I was intrigued by your tutorial. 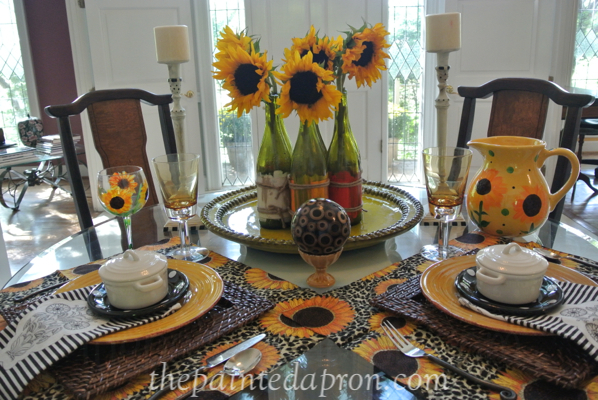 Your sunflower tablescape is charming and artfully done. 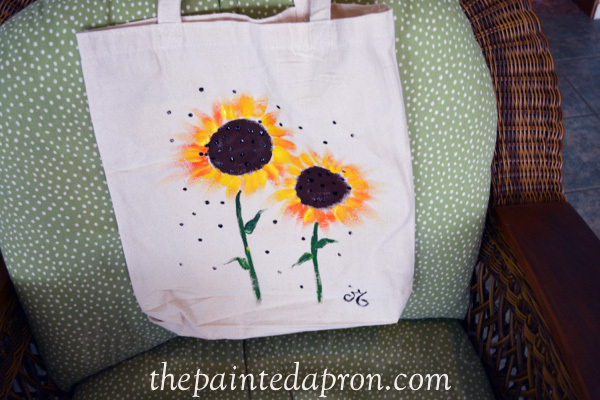 Love all your hand painted items. P.S. LOVE your table, too!! The color combinations work so well. Wherever did you find those placemats?! Thanks so much for the tutorial, Jenna. 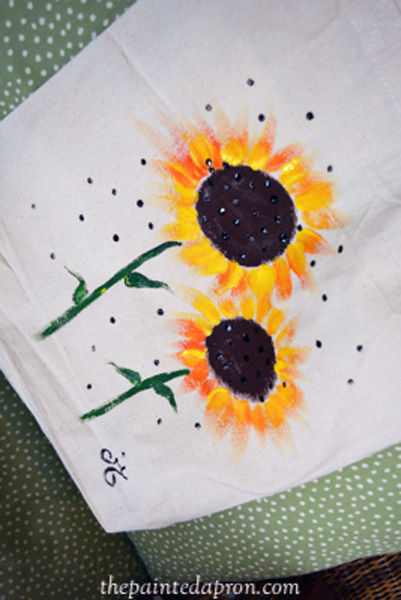 I really need to pick up the brushes and paints again! Your pitcher is fabulous! Love it. I love sunflowers. I’ve never tried painting, but you make it look easy. Jenna, you make it look so easy! 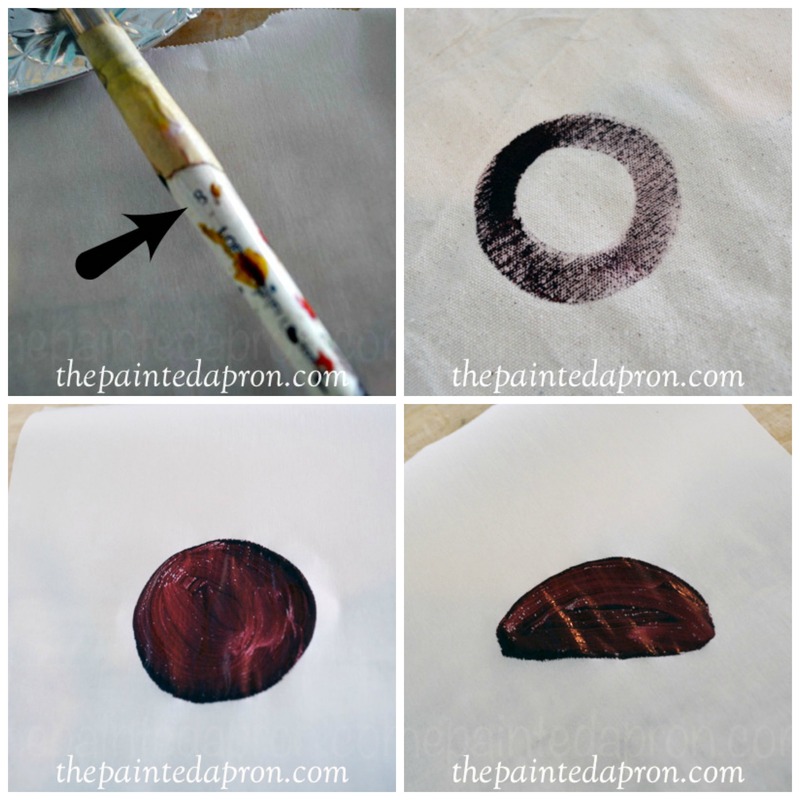 What a great tutorial for those of us like me who’s never picked up a paint brush other to paint the interior walls. 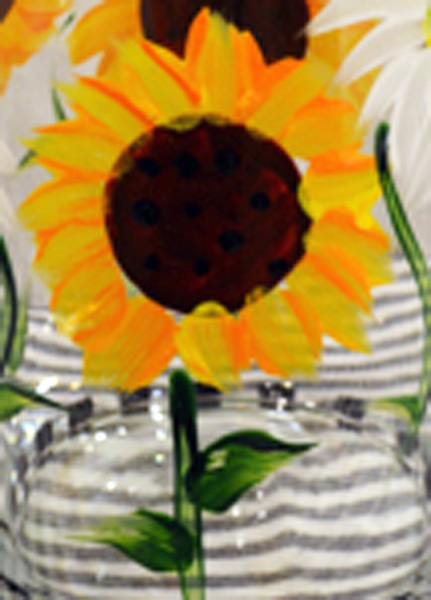 Love your sunflower painting and your bottle vignette. That’s one I need to remember when arranging, I never have enough to fill a vase! 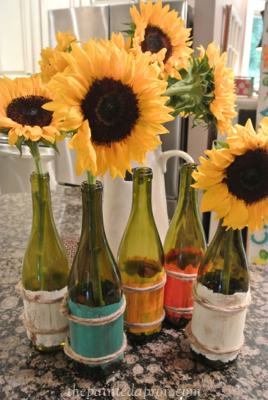 I have just the bottles and I think I will pick up sunflowers tomorrow at the market. You’re already delivering on your promise to give more painting tutorials. Thank you! Your sunflowers are very happy and fun. 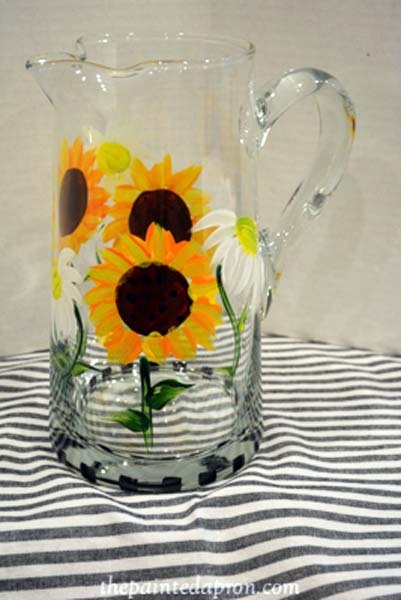 I especially love the black check detail with the sunflowers. I have some fabric medium, so I’m tempted to paint something fabric around here. Of course I will tell you. 🙂 I hope you have a fun weekend! 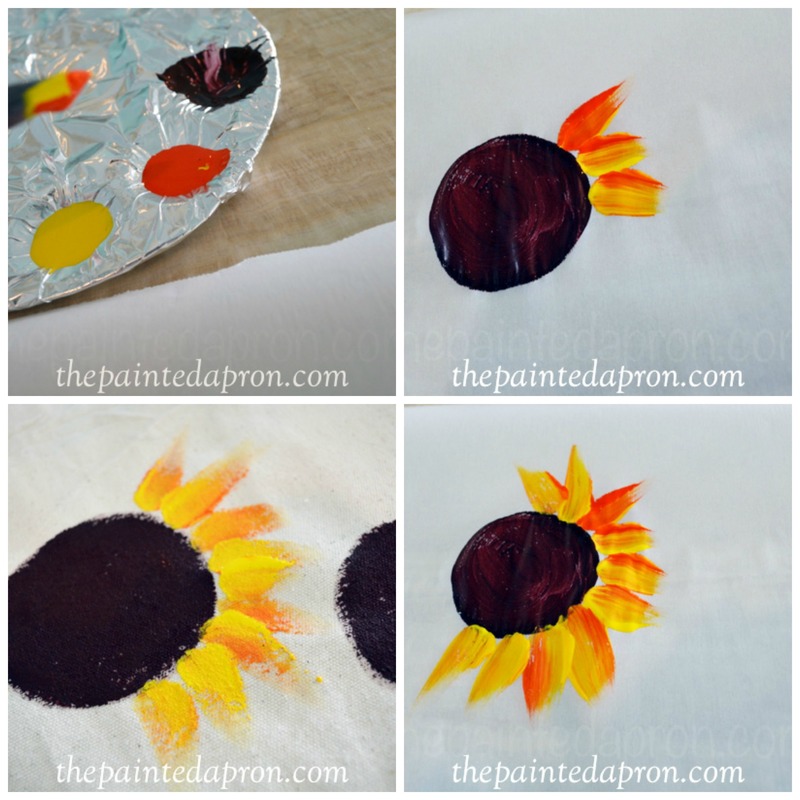 I always love your tutorials — and these sunflowers are so pretty. Did you see my photo yesterday of the big field of these things behind Headley’s Market? 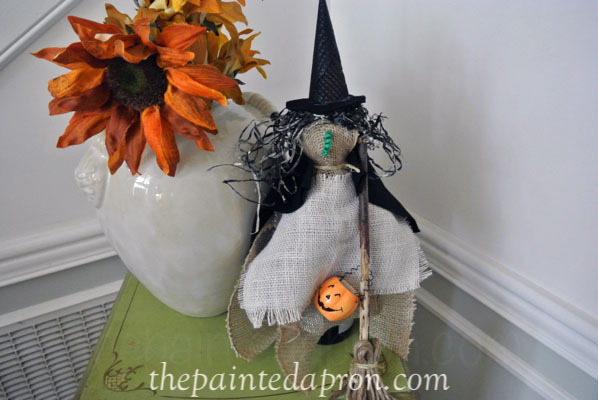 Thanks Ellen, sorry I have been behind on my reading~ great post, you gotta love the peach! 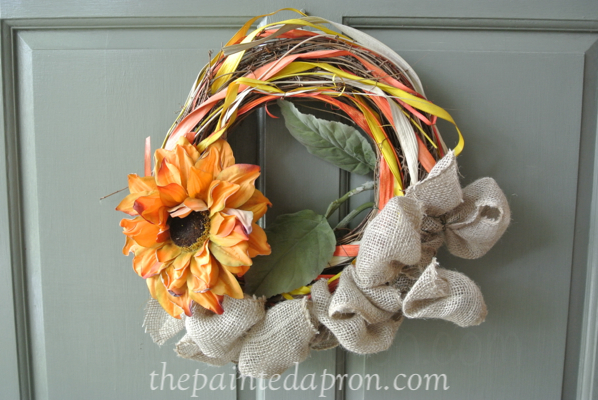 I love this DIY and the flowers look so pretty. Yellow is such a happy colour. Living a stone’s throw away from The Sunflower State (Kansas), I see sunflowers in huge quantities just growing wild along the highways and byways. It’s really pretty cool, and it definitely gets me hyped up for all the late summer activities! I can’t paint a lick. I can barely write! I just don’t have that gene. But I love how you’re able to so effortlessly create such fun images!!! You really have “the gift”!!! These are lovely, especially on glass. 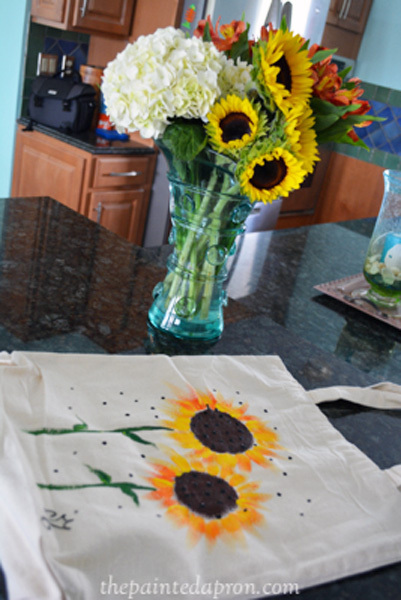 I love sun flowers!! Thanks so much for your tutorial! I have been creatively blocked when it comes to tables!! 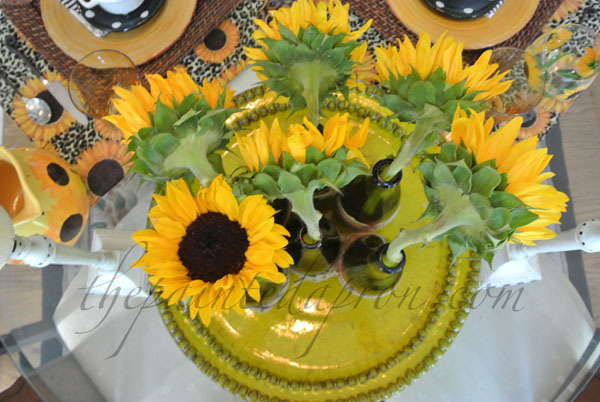 I have been working on other projects – Your sunflower table looks so cute – makes me want to set a table! Thanks Ann, glad I could help! Thanks so much for sharing at the Twirl & Take a Bow Party! Very cool! 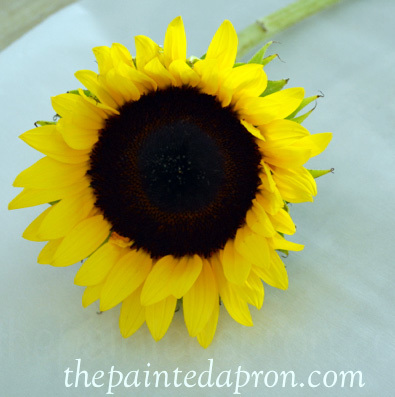 Love, love, love, these sunflower, all of them. I think my favorite is the pitcher. Pinned! Beautiful sunflowers! 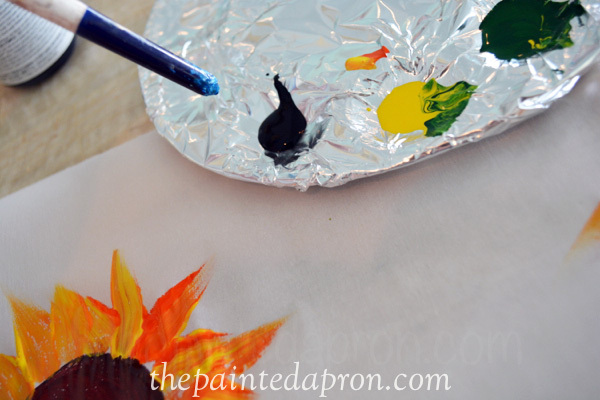 Your painting technique makes it look so easy that even I could do it! I agree with Rosie, those “bandana” placemats are awesome on this table. 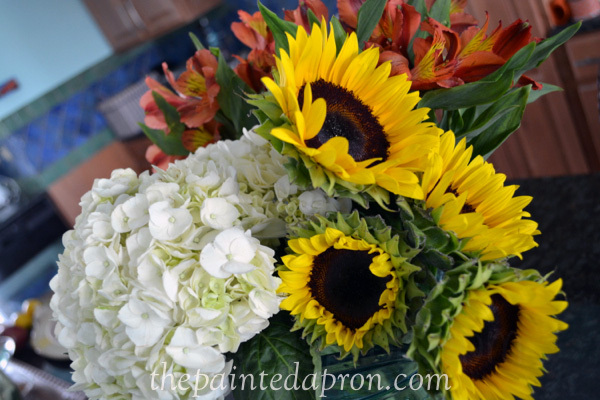 The tablescape is a wonderful tribute to sunflowers – gorgeous! 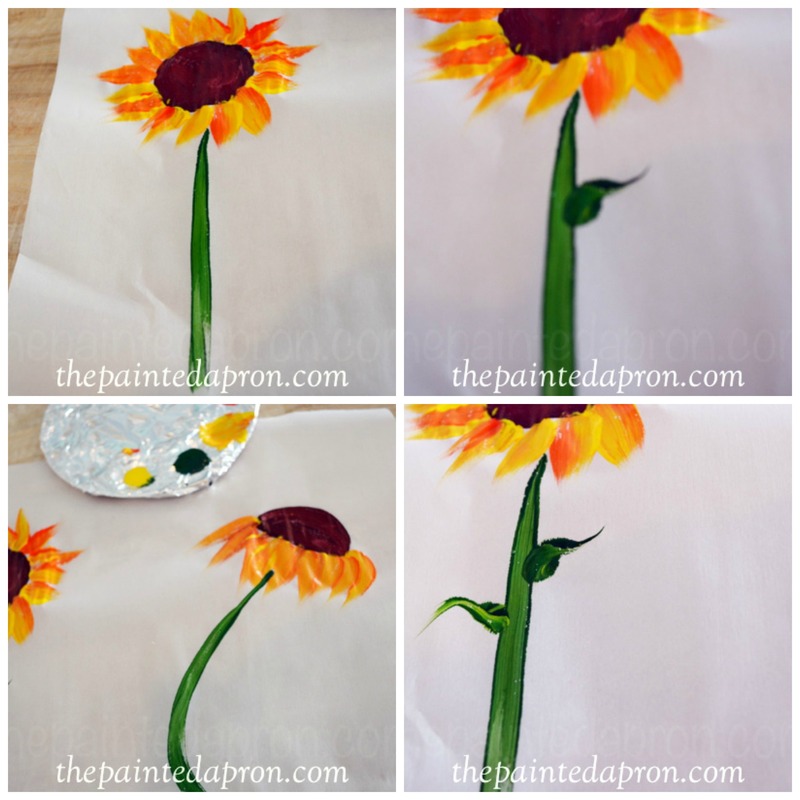 Thank you for the tutorial on painting sunflowers, it would be fun to paint some cheerful sunflowers on a set of napkins. Let me know if they turn out! This tutorial is so easy!! Thank you so much for such an amazing activity! 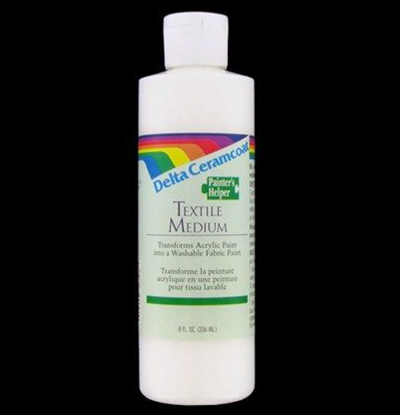 I was wondering if there is something special that I have to use when painting on the glass? And, do I also have to do anything special to make it permanent? Thanks again! Love your site! !